“The days and nights of London now – as told by those who love it, hate it, live it, left it and long for it”. What I loved about this book was that within the eighty stories that are shared, there were so many that fell true to my own experiences of London. Each individual story from the Londoners captured in the book is unique, entertaining and tells true to the emotion behind their London life. 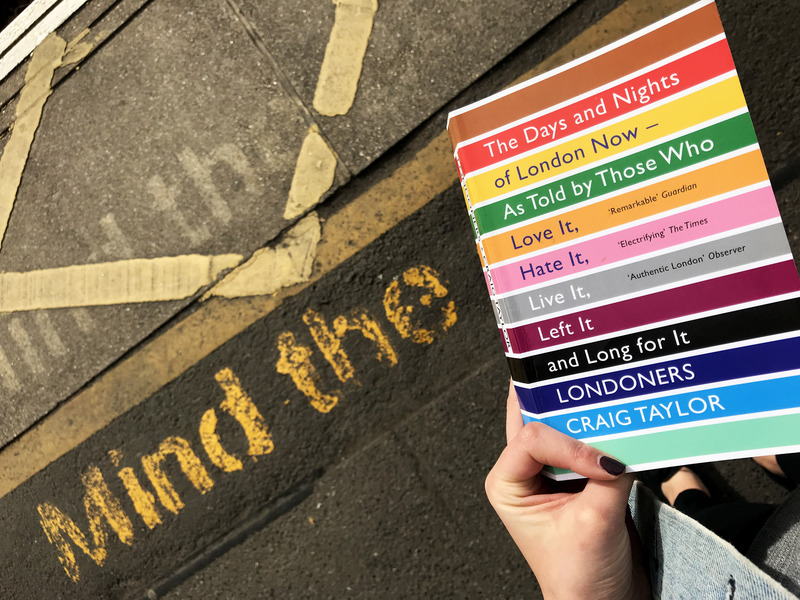 The stories cover the breadth of the city, from terrible tales about brothels in Clapham South (not to be seen these days), bin men, bankers and nail technicians to squatters, ex drug dealers and even the woman who’s voice was picked to be the underground station annoucer. There’s stories about arriving and departing London, coming from other countries, moving from up North. Many have lived here all their lives – a true 21st representation of London life today. So with that in mind, here’s my “arriving in London” story, back in 2011.. I hadn’t been to London that many times before I moved there in the summer of 2011. We’d visited my uncle down here when I was a kid and I remember having mushroom pasta and buying a TY beanie at Hamley’s. When we moved in 2012 I didn’t really understand the extent of the transport network and with work being near Heathrow we picked a property that wasn’t too far from the tube. I had no clue about the vast train network and driving to work didn’t even cross my mind. Three of us from the North and one from the South West, all girls who had met on Facebook in a group chat for other interns starting at the same company. The house wasn’t great. It was rented to us by a crazy man who liked to smoke weed and brought us copies of his travel magazine. Two of the bedrooms were weirdly connected via a little alcove, I think originally it was a living room & dining room, but of course we had bedrooms in there. What was now the living room was more of a corridor and there was a hole in the ceiling filled in with an orange Sainsbury’s bag, god knows what there was a hole haha. Below the hole was an old Nokia TV; I didn’t even know Nokia made TVs. When we first moved in we didn’t know how to make the heating work, and it wasn’t until the winter when some firemen came to check our smoke alarms that we asked embarrassedly if they could take a look. Turns out the thermostat in the living room was turned to 5 degrees. We were so pleased we’d asked, even though we hated the fact we looked like that terrible stereotype of “stupid girls”. My bedroom was enormous. There was a grimy sink in the corner and I had to put caustic soda down the drain once a month to clear whatever awful thing was blocking it. When I first moved in there was a weird additional single bed in there too, with black sheets. Black sheets have always freaked me out a little bit, they’re so gross. Despite the haphazard set up of the house, we made it our own with photos on the walls, clothes everywhere and of course then went out and about as much as our intern wage would allow us to (Wednesdays at Opal in central – RIP Opal). During that summer it was the 2011 riots. Ealing Broadway was heavily affected, West Ealing where we were, less so but I do remember peeking out of my bedroom window and watching a group of people running down my street jumping into a van and screaming off down the road. It was honestly terrifying. The following day my managers joked that I’d been involved cos I was Northern (harsh). I remember hearing about how badly Clapham had been affected. Back then, Clapham (all too familiar now), was a far and distant place in south London and I couldn’t imagine who lived there. I was sad for people who lived above shops which had been targeted, fires, theft and whatever. Lots of shops in Ealing were boarded up, there was billboards looking for people across London who had been involved in causing the most trouble and photos of fires across the Metro paper every morning. That was my first experience of living in London – clearly wasn’t that scary as I’m still here!